Mar is a paper artist working out of the Gràcia neighborhood of Barcelona, Spain. 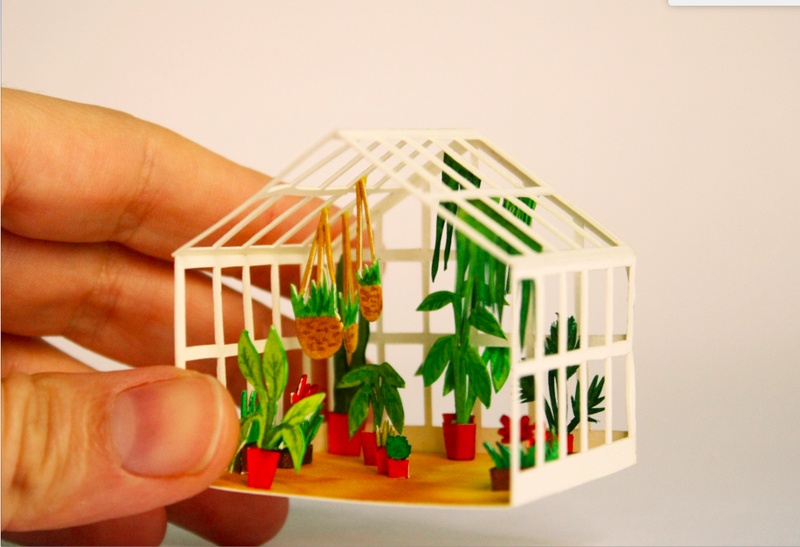 Meticulously cutting paper into miniature 3-dimensional forms, she creates entire scenes and landscapes that somehow captivate the imagination but fit into the palm of your hand. 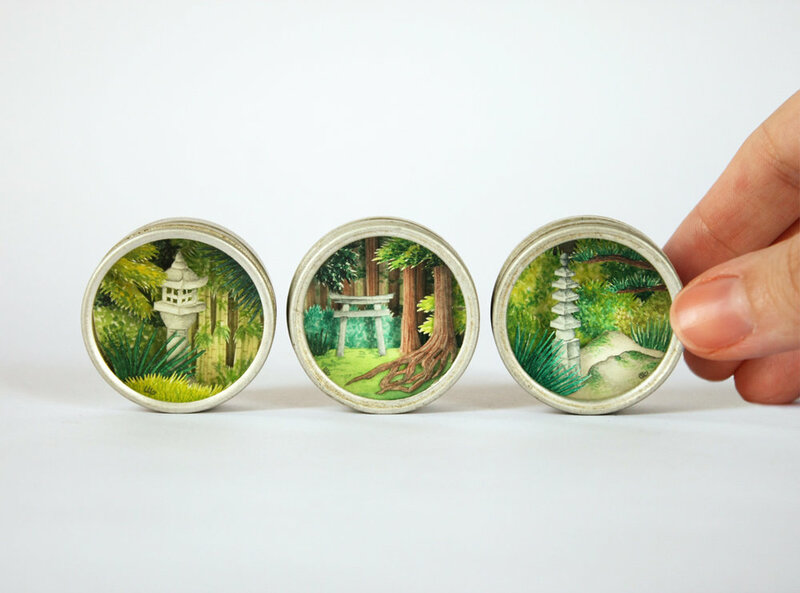 Her work seamlessly straddles the line between craft and fine art, with reference to film and popular culture, it can be cute and clever, but always delicate and beautiful. Check out more of her work on her Instagram or her website. Internet, or more specifically, Instagram, plays an important role in my professional life. Not only do I have the opportunity to sneak into someone else's studio and discover new artists and keep up with an art galleries' news but I'm able to show my art process as well, like a studio visit. I love the process of my work, so Instagram is a good place to share this with others, not only the final piece. For me, social media is a good tool to see a direct response to my work from the audience. I see what it is that they like more or less, what connects better with the public, what messages are more well understood and I learn from my own work through their view. Having so many followers around the world has taught me a lot and has put me in contact with some great costumers and clients. I find inspiration in so many places. One of my main inspirations is cinema, of course. But also my city and other cities I've been. I usually work with images I've found of frames from films or photos that I've taken while walking around some cities (I would be mortified to admit how many photos I take on my travels!) Google images is a great way of finding images as well as Pinterest to find and organize inspirational images I want to use. People can follow me on Pinterest, but I don't use it as social media really. I haven't found other people working on copies of my work yet. I've found people trying to reproduce something similar, in their own way, perhaps as a personal project and as a craft idea. That kind of "copy" makes me so honored, as they tag me and show me they work inspired by mine and it's a very humbling feeling, to be able to inspire others. But I guess finding an artist working and selling real copies of my work would be hard, I'm not sure how I would deal with it. It would also strike to my insecurities, for sure. The key is passion, to find the things that come from your heart and make you passionate about. If you love what you are doing then it’s more likely than the audience will love it too, more than if you try to imitate some other artists because they are having success or what they do is awesome. One can’t imitate someone else’s passion. Everyone is different and we need to find the thing that makes us different and show it. The world is big enough for everybody so you have to find your place on it and don’t despair when you get a lot of “no”, it’s only that you are not knocking at the right door, at the right place. You need to keep learning, keep practicing and knock new doors. I love to visit the blogs of The Jealous Curator (and listen to her great podcasts of conversations with artists), This is Colossal and Artistic Moods. And as an Instagram addict I love to follow talented artists as @AlyssaMees, @MabGraves, @KelseyJBeckett, @BaotPham, @RebeccaGreenIllustration, the paper artist @AllieMayKiphuth, @Ollanski, @HattieNewman, some paper collectives as @StrictlyPaperArt and @PaperArtistCollective, and of course yours, Sarah!